Know Your London | A good place to find out about the history of Inner London. There’s no fake-history on this Website. Above: One of a pair of dragons making the entrance into the City on the Victoria Embankment. The 23rd of April is St George’s Day and in recognition of that fact, we shall talk about two special dragon figures in London. They stand either side of the Victoria Embankment, marking the boundary of the City of London with Westminster. 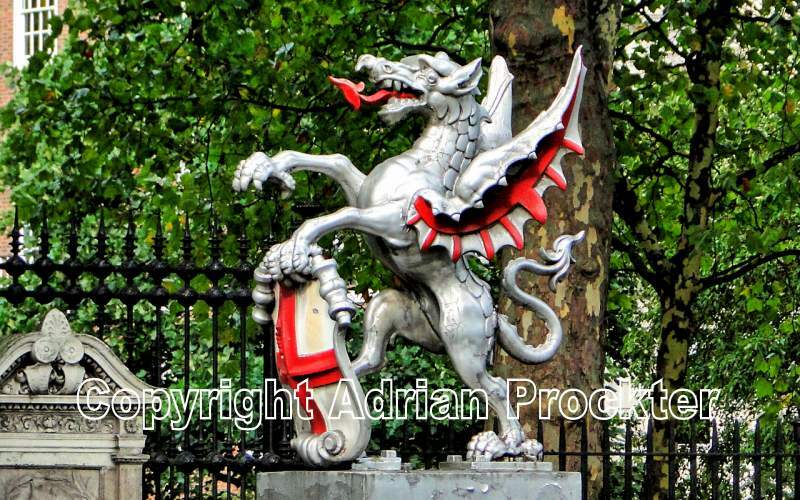 Dragon figures now mark the boundary of the City of London on all roads approaching the City of London but that idea only goes back to the 1960s. The design of the dragons is based on two large dragon sculptures, seven feet high, which were mounted above the entrance to the 1849 Coal Exchange. This was a large building which stood on the north side of Lower Thames Street, designed by the City Architect, J B Bunning. The two figures were cast by London founder, Dewer, in 1849. The Coal Exchange was demolished between 1962 and 1963 for road widening. The two original dragons were carefully removed and re-erected on six feet high plinths of Portland stone at the western boundary of the City, near Temple Gardens on the Victoria Embankment, in October 1963. The Corporation of London’s Streets Committee selected the statues as the model for boundary markers for the city in 1964. Half-size replicas of the originals were made by Birmingham Guild Limited and erected at the main approach roads to the City of London in the late 1960s. There are also a pair at the southern end of London Bridge – marking the boundary between the City of London and Southwark. The most impressive of all the City dragon markers are the pair on the Victoria Embankment. Not only are they the largest but, of course, they are the oldest – celebrating 170 years this year. 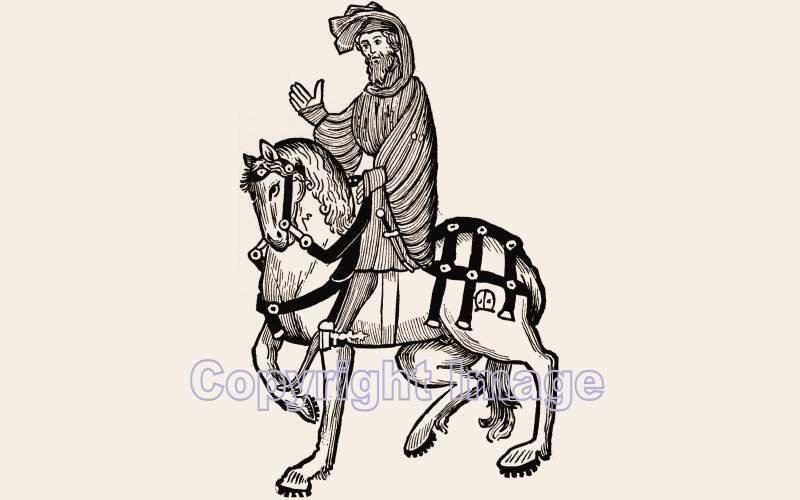 In Chaucer’s group of 29 pilgrims – who spent the night at the Tabard Inn before setting off for Canterbury in the morning – there was a Knight who had with him his son who is described as a Squire. As it says in the narrative, he was about 20 years old and he had been well trained by his father. One day, no doubt, the son aspired to be a Knight as well. With locks as curly as if they had been pressed. Of time, in hope to win his lady’s grace. And full of freshest flowers, red and white. He slept as little as a nightingale. This young man was well brought up and showed his good manners at all times – towards others and particularly towards his father who he obviously respected and loved. One day he was hoping to be like his father in word and also in his deeds. Although the Prologue to the ‘Canterbury Tales’ is only a small fraction of the entire work, it is in many ways the most interesting. Because the descriptions of the pilgrims are so vivid, they make you feel that you have really met those who gathered in the Tabard Inn. The Prologue describes how, in the spring, a group of pilgrims met in the Tabard Inn. Its site can still be found in the form of Talbot Yard which is the next alleyway south of the George Inn – both on the east side of Borough High Street. The original name of the Tabard Inn was taken from the name of tunics worn by heralds. In later times the name of the inn was altered to Talbot which is a type of hunting dog and so the yard of the inn known to Chaucer now bears the name Talbot Yard. Geoffrey Chaucer had many prejudices towards several members of the group of 29 that he describes in his Prologue. Others in the group come in for far less criticism and for the next two articles we shall look at a father and his son. The father was a knight – we are still in the days of chivalry and knights in armour which extended until the 16th century. The knight was accompanied by his son who, one day, aspired to also become a knight. Chaucer calls him a Squire. 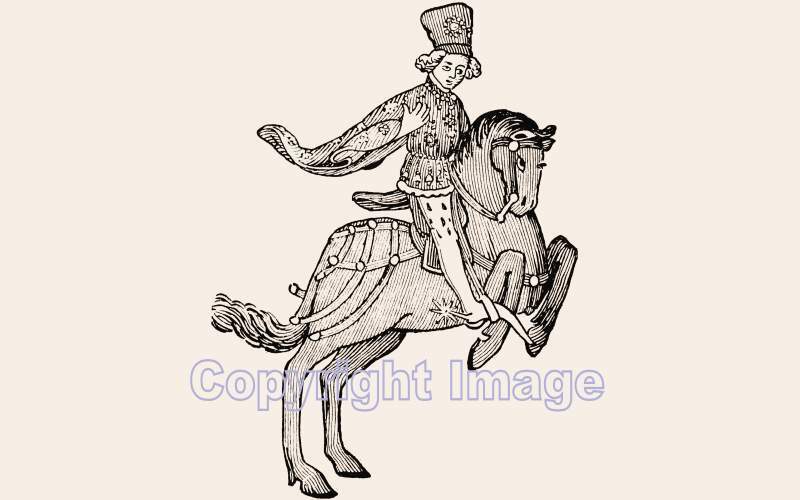 The Knight was the first of the 29 people in the group to be described and it is obvious that Chaucer had great admiration for this man. Knights were hired to fight in the King’s wars and, if they were deemed to have fought well, were handsomely rewarded financially on their return to England. The down-side to being a knight is that you could easily be killed in battle fighting for your King. ‘And at a Knight I therefore will begin. Truth, honour, generousness, and courtesy. And ever honoured for his noble graces. When we took Alexandria, he was there. Of honour, above all nations, when in Prussia. No Christian man so often, of his rank. He had embarked with many a noble host. Thrice in the lists, and always killed his man. The lines above describe how at the time when Chaucer was alive (during the 14th century) knights went out to Spain and North Africa to fight against marauding tribes. Pilgrims from all over Europe, including England, journeyed across Spain, calling at the famous church of Santiago De Compostela before turning south to cross over the sea to North Africa and continue their pilgrimage to the holy shrine in Jerusalem. To non-believers, the pilgrims were ‘easy pickings’ and they were often robbed. Knights often rode with a group of pilgrims to try to protect them from such a fate. Their journey was a long a perilous one before they finally reached Jerusalem. ‘He was of sovereign value in all eyes. And in his bearing modest as a maid. Fine horses, but he was not gaily dressed. The Knight on his fine horse was in stark contrast to the scruffy ill-tempered miller who we have already described in another blog. This is the fascination of Chaucer’s Prologue – all his characters as so life-like and all so completely different from each other. Of course, for us, it is hard to imagine a person like the Knight. The nearest we come to someone like him is probably a man with a military background whose training in army procedure is noticeable in a group of other people. Above: View of the pub today. The present pub, built in 1898, stands on the site that was once beside the stream mentioned in the ‘Canterbury Tales’ by Geoffrey Chaucer. It is closed at the time of writing and sadly, as with so many pubs in London, its future is uncertain. It has passed through several owners in recent years who have not only run it as a pub but also as a night club and also a restaurant. 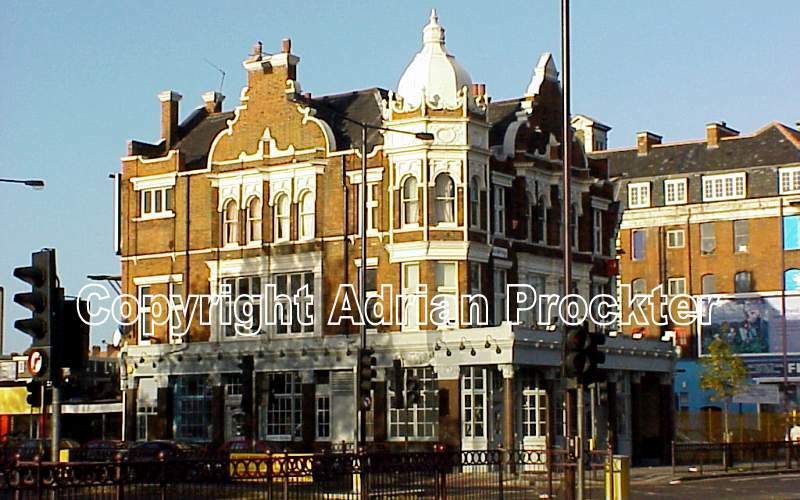 The sad fact of the matter is that the pub stands on an inhospitable corner – at the junction of Albany Road with Old Kent Road – with endless heavy traffic on both Old Kent Road and also the busy junction of Albany Road. Apart from the large Tesco, on the opposite side of Old Kent Road, which is always busy with shoppers, there is little in the area to attract social groups to meet at the pub with the result that the immediate vicinity has become rather a wasteland. The pub had a great reputation for its upstairs rooms where well-known boxers used the rings and training facilities to perfect their art. It was known to the boxer Frank Bruno and was the place where Henry Cooper trained. Once a flourishing pub, the premises passed through a few owners who tried in vain to make the premises a success. The last use was as ‘Rock Island’ – a bar and grill which closed in April 2018. Quite what will become of the pub is hard to tell. In 2015 the building was listed as an ‘asset of community value’ under the Localism Act. This followed after a campaign by the Walworth Society which means the building is, therefore, unlikely to be demolished. It stands at 320-322 Old Kent Road. If you trace the history of the site back to medieval times, you will find that there has been some sort of hostelry on the land from the 14th century onwards. The early hostelry on the site was known as Thomas a Watering. The name relates to Thomas a Becket, Archbishop of Canterbury, who was murdered by four knights inside Canterbury Cathedral on 29 December 1170. His tomb in the cathedral became a place where pilgrims flocked within a few years of his martyrdom. Pilgrims starting off from London, travelled to Canterbury via the route that had originally been a Roman road. The site of the pub is very close to the ancient Southwark-Camberwell parish boundaries, being the last building within the Southwark boundary going east along Old Kent Road. It is a point on Old Kent Road with plenty of history. In late medieval and Tudor times, it was a place where the Lord Mayor of London would stand to welcome home victorious kings from battles in France and elsewhere. For example, the Mayor and citizens of the City of London waited to greet Henry V and his troops on their return to England on 25 November 1415. The decisive battle had taken place on 25 October 1415 (Saint Crispin’s Day). On a more grisly note, nearby was the place of execution, by hanging, from at least 1456 until the middle of the 18th century. It was considered a good idea to conduct hangings well away from places where the citizens lived. By setting up a gallows beside the main road, the body could be left to rot and act as a deterrent to those passing by. However, no matter how grim the punishment, most law-breakers knew that the chances of them being caught were very low in those times and a corpse hanging beside the main road did little to reduce crime in general. 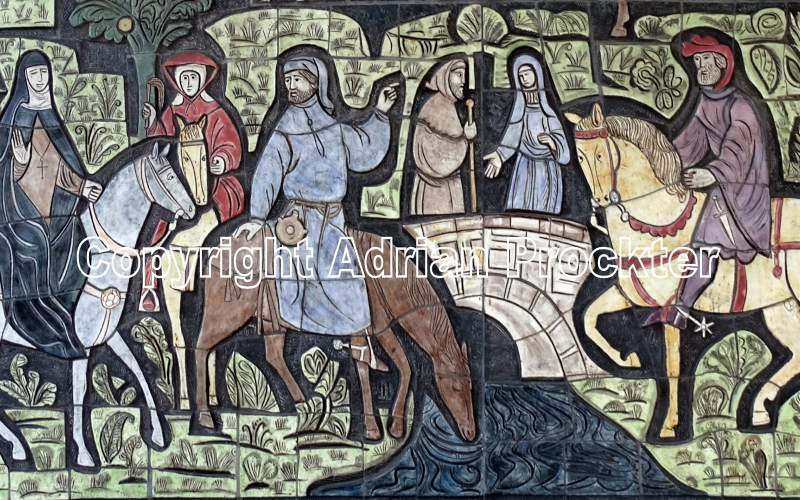 Above: A small part of the Chaucer Pilgrims Mural showing the horses and riders at the stream which once flowed across the Old Kent Road. The addition of a bridge probably came one or two centuries after Chaucer’s time. Geoffrey Chaucer’s ‘Prologue’ to the ‘Canterbury Tales’ tells the reader that there were ‘nine and twenty in the company’ of pilgrims who set off from the Tabard Inn – which was on the east side of Borough High Street. The ‘Tales’ were written in 1386 and while it is a work of fiction, its description of the people in the ‘Prologue’ should not be dismissed as pure fantasy. The stories in the ‘Canterbury Tales’ were fiction. They were a reworking of well-known tales. The descriptions of the pilgrims were most likely based on real people that Chaucer either knew or had seen in the street. Chaucer was a keen observer of character and the people he describes seem to leap off the page at the reader. The pilgrim route to Canterbury from London usually started with people staying at one of the inns in Borough High Street for the night before departure the next day. Chaucer would have known the inns well. He chose the Tabard Inn to set the scene for his ‘Tales’. He might even have known the real landlord. The pilgrim route to Canterbury was via Old Kent Road, Deptford Bridge, Shooter’s Hill, Dartford, Rochester and Faversham. It was the old A2 which in part has been replaced by newer sections and the M2. Only brief mentions of some of the places that the pilgrims passed through are mentioned in the text. It is believed that the pilgrims took four days to reach Canterbury from London. Since the route is about 60 miles, they must have walked or ridden about 15 miles each day. In fact, the narrative says that by the end of the first day they had only reached Deptford – a distance of four or five miles. Perhaps they travelled further on the other days or just extended the total journey time by a day. Their route would have led south from the Tabard Inn, continuing down Borough High Street to the church of St George the Martyr (now with Borough Underground Station on the opposite corner) where they would have turned left and walked along Tabard Street. It would not have had that name then. The wider Great Dover Street, running parallel, was not constructed until much later. Following Tabard Street would have brought the pilgrims to what is now a huge roundabout which is the start of Old Kent Road. As the pilgrims followed the road, they would only have to travel a short distance before they reached a tiny stream crossing their path. The horses stopped in their tracks to refresh themselves with a drink of water. As the years went by, a tavern was set up so that the riders could also take some refreshment. The spot became known as ‘Thomas a Watering’ – referring to the fact that the pilgrims were on their way to see the Shrine of Thomas a Becket in Canterbury Cathedral. The stream, which was known as Earl’s Sluice, no longer flows above ground. It flowed along the line of today’s Albany Road and crossed Old Kent Road on its way to the Thames. My lords! Remember what you promised me. These lines are right at the end of the ‘Prologue’ and lead to the account of the Knight telling his tale. Today’s Thomas a Becket pub, therefore, has a direct connection with the history of a location on Old Kent Road that goes back over 600 years. If you go there today you will see the same layout but the stream is no longer visible. The Victorian pub called Thomas a Becket probably stands on the site of the ancient tavern. On the opposite side of Old Kent Road is a large Tesco supermarket. The rather idyllic description of a tiny stream crossing a long country road is rather shattered by what is to be seen there today. We will take a two-week Easter break from the selection of items relating to the theme of Poplar. Starting today, we look at some of the aspects of the pilgrims as described in Chaucer’s ‘Canterbury Tales’. This is something that we have done each year and another two of his colourful characters have been chosen for the coming days. As it happens, Easter Sunday falls on 21 April and only two days later it is St George’s Day when we usually find some related topic by way of celebration. This year we shall consider two very special London dragons in recognition of the date. Above: Aerial view looking west across the northern end of the Isle of Dogs. The points of interest are described in the text. If you are a photographer, you will probably have come across a scene and wished that you could gain a higher viewpoint to make better sense of the view. These days, of course, drone photography is ‘the thing’. Back in the 1980s drone photography was only a dream and personal photography was conducted with both feet firmly on the ground. The London Docklands Development Corporation (LDDC) was formed in 1981 and, with huge resources, they sometimes scrambled a helicopter on a sunny day to ‘get the feel’ of the large expanse of land that they were developing. The above photograph was taken from a helicopter hovering above the Greenwich Peninsula (where North Greenwich Underground Station is now situated) on a day with good visibility. The exact date is not known but it was probably about 1984 which means that it is about 35 years old. Part of the Greenwich Peninsula lies along the bottom of the image. The white chimney (bottom right) is a ventilator shaft for one of the Blackwall Tunnels and is now incorporated into the structure of the large O2 Arena. In the centre of the view, we look west across part of the Isle of Dogs, with the old village of Poplar (to the far right). The three parallel lengths of water, almost devoid of any buildings, are the West India Docks – the one on the left being South Dock. 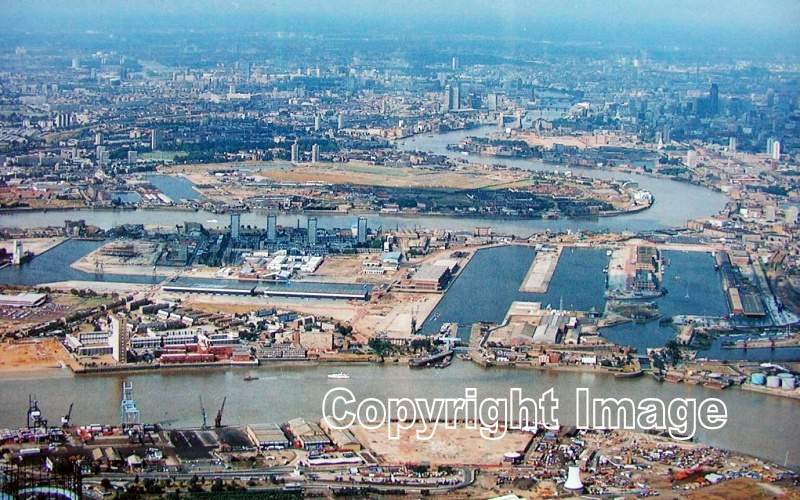 Today, a similar view would reveal that some of those docks were filled in and the whole scene would be one with very tall office blocks because the land around the docks was used to build the Canary Wharf Estate. Further to the left are two docks forming a reverse letter ‘L’. They are the Millwall Docks which are now also surrounded by tall blocks – some are offices but most of them are residential apartments. The white tower block beside the Thames (to the right of what looks like a beach) was constructed in the 1960s and is part of the Samuda Estate. On the edge of the Isle of Dogs furthest from the camera are four tower blocks of flats which are still in existence on another 1960s housing estate. To ‘get your bearings’, as the River Thames ‘snakes round’ towards the top of the view, it is just possible to see Tower Bridge, with a few of the tall offices of the City of London (far right). Below Tower Bridge is most of Wapping (right side of the Thames) and a large part of Bermondsey (left side of the Thames). On the Bermondsey side of the Thames are two old docks (towards the left near the centre) which remain today – called Greenland Dock and South Dock. Rather confusingly there are two docks called ‘South Dock’. There is a very large one which is part of the three old West India Docks. There is also the small old dock which was once part of the Surrey Commercial Docks. South Dock, on the south side of the Thames, along with Greenland Dock are nearly all that remains of the old Surrey Commercial Docks system. To the right of those two docks, we see open land which was the result of filling in most of the other original docks. All that land became used mainly for housing and also the site of a shopping centre called Surrey Quays. That land is part of Rotherhithe. In the haze (at the top of the view) are parts of Westminster and Chelsea. The view presents a picture of the Isle of Dogs, Wapping and Rotherhithe that now seems incomprehensible. It was taken within the first three years of the tenure of the LDDC – when they were busy laying out roads and putting in other infrastructures, like drainage and electricity cables. The houses and large office blocks started to rise a few years after this picture was taken forming what we know today as Docklands. Above: The remaining offices on the large site beside Westferry Road which remain from the days when the land was a shipyard. 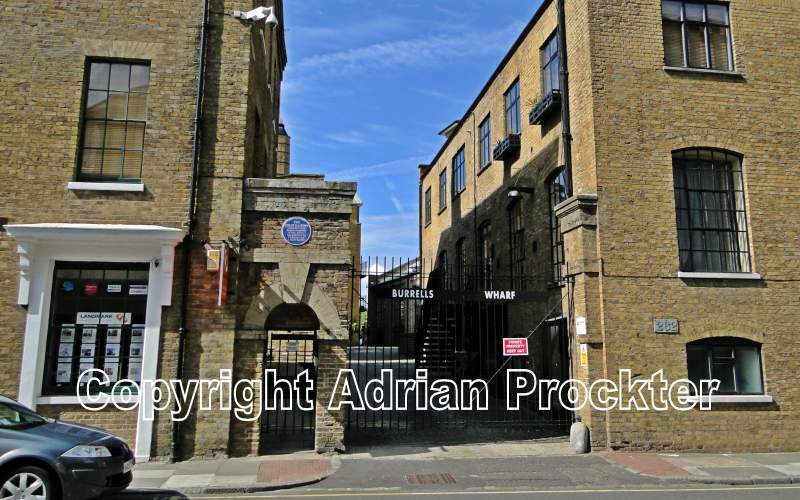 The Blue Plaque commemorates the fact that the famous ‘Great Eastern’ was constructed on the site. As well as the West India Docks and the Millwall Docks taking up a large part of the Isle of Dogs, along with large warehouses with railway access, there was a large amount of heavy industry carried out by many factories. Many of these factories produced items that were related to ship-building or ship repair. Considering how much land was occupied by the docks and their adjacent warehouses, it is rather surprising to find that such industries – many with large factory premises of their own – were able to find the space to carry on their businesses. In addition, you have the fact that countless dockers and their families lived on the Isle of Dogs, along with most of the workers in the factories just mentioned who also lived very close to their place of work with their families. As can be seen from this very graphic description, the Isle of Dogs was a very busy place – with large factories and endless terraced houses in narrow streets ‘squeezed’ in wherever there was enough space. In addition, there were numerous pubs – almost one on every street corner. Then, don’t forget the schools and the rows of local shops. Besant mentions ‘oil storage, oil paint, colour, and varnish, works’. As an example of this, towards the SE ‘corner’ of the Isle of Dogs is a housing estate around Burrell’s Wharf Square. That name commemorates the site of Burrell & Company who were oil refiners and manufacturers of paints, varnishes and colours. They were in operation from the late 1880s until the early 1920s and were a famous name in their particular trade. Just north of that site is Napier Avenue, recalling the site of Napier Yard – a ship-yard owned by Scott Russell. It was there that Isambard Brunel designed and built the ‘SS Great Eastern’. Brunel worked to breaking point and finally, in 1858, the ship was eventually launched. Part of the enormous slipway remains to be seen on the site as well as the buildings that are shown in the picture. Following the words of the ‘Good Book,’ we can say that ‘In the beginning’ we have plenty of accounts of the history of the Isle of Dogs but there are no good maps until 1746 when John Rocque published his wonderfully detailed map that included almost all of what is now Inner London. 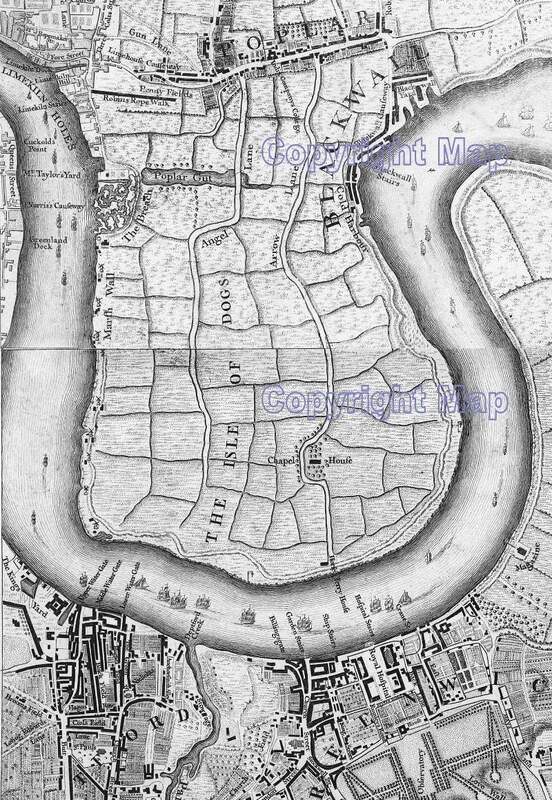 When John Rocque published his map, there were no docks on the Isle of Dogs. Within the space of just over 50 years the City Canal was cut across the ‘island’ and two huge docks, extending across the width of the land, formed the West India Docks. Just over 50 years after that the Millwall Docks were to be dug out of the marshy land. Rocque’s map really does show in detail the original marshy state of the farmland that filled the ‘island’. You may need a modern street atlas handy to compare this map with what is there today. Just north of the Isle of Dogs, on the western side is Limehouse. Working around the river from that point, we can see the names listed below. The Breach – Where, in 1660, the large piece of the dyke (which extended around the whole of the Isle of Dogs) was destroyed, having been weakened by ballast-digging on the foreshore. Poplar Gut – This was also caused when the Thames broke through The Breach and flooded the land. This flooded land remained in that state until the City Canal was dug across the Isle of Dogs. Windmills – Working south, we can see nine windmills carefully drawn on the map. Other authorities say there were only seven windmills and one source mentions eleven. Whatever the number there were quite a few, built on top of the wide dyke to take advantage of the prevailing westerly winds. Marsh Wall – This was the early name for the track on top of the dyke along the western side of Isle of Dogs. The name of that track today is Westferry Road. Trying to keep history alive, the London Docklands Development Corporation (LDDC) laid out a new road across the Isle of Dogs with the old name of Marsh Wall which had completely vanished from modern street maps. However, the modern road has no connection with the old one shown on Rocque. Isle of Dogs – Notice that Rocque uses the name ‘Isle of Dogs’. The old name for this land was Stepney Marsh. Gallows – Look carefully at the most southerly point on Rocque’s map and you will see a gallows. Look also further round the ‘island’, at the most easterly point and there is another gallows. Considering how few people lived on the Isle of Dogs at the time – just see how few houses are shown – it is surprising that there was a need for two sets of gallows. Arrow Lane – a long winding road runs from north to south across the Isle of Dogs, ending at the ‘Horse Ferry House’. The road – greatly changed in alignment – is now known as East Ferry Road and ends at a pub with the slightly different name of ‘The Ferry House’. A horse-ferry plied between the Isle of Dogs and Greenwich. Angel Lane – The alignment of this thoroughfare has been lost over time. Chapel House – the only building on the southern part of the Isle of Dogs is labelled ‘Chapel House’. There was indeed a chapel known as ‘St Mary in Stepney Marsh’. It was known to be in existence in 1380 and last mentioned n the middle of the 15th century. Cold Harbour – Working along the east side of the Isle of Dogs, we see a street of houses marked ‘Cold Harbour’. That street, still called ‘Coldharbour’ remains to this day. Blackwall Causeway – Blackwall Causeway and Blackwall Stairs were part of the original hamlet of Blackwall which was so-called because of the large dark dyke of mud at this point on the river. As a result, a ship-building yard nearby was also called Blackwall Yard at a later time and remained in use until the 1980s.